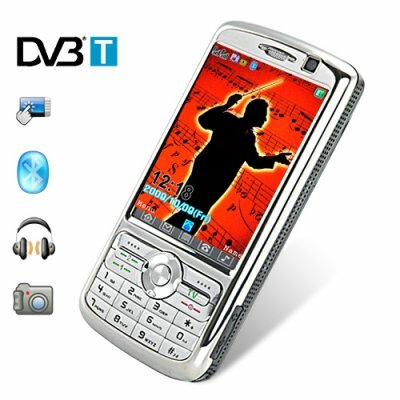 Successfully Added Maestro - 3 Inch Touchscreen Dualband Dual-SIM Cellphone (DVB-T) to your Shopping Cart. Say hello to the Maestro, an unlocked Dual-SIM mobile phone with amazing DVB-T reception! Order your Maestro now, and get your hands on this communication and media powerhouse which also comes with not one, but two rechargeable lithium-ion batteries and a 1GB microSD card for free! Technical Wizard: The Maestro is a first class cell phone with support for the 900MHz and 1800MHz GSM frequencies. It has two SIM card slots (Dual SIM and Dual Standby) which is ideal for anyone who wants to keep two active phone numbers (personal and business) inside one great phone! The CVJA-M53 also comes fully unlocked, meaning you can use it with any cell carrier or network you want. It's also got Bluetooth (which allows you to pair your phone with tons of devices like handsfree headsets) and here's something really convenient - you have the choice of text input by touchscreen (for the iPhone types) or keypad (for the Nokia types)! Media Maven: This versatile dual band, dual SIM, smart phone comes with a vibrant 3.0 inch touchscreen and a host of media functions to transform your analog life to digital - a 1600x1200 resolution digital camera, video recorder, video player, audio player, sound recorder, FM radio, and a powerful DVB-T receiver that doesn't disappoint makes this phone a sure crowd pleaser. Throw some movies and songs into the phone by USB cable or microSD and suddenly you have a palm-sized audio video theatre in your hands! Ruggedly constructed and stylishly designed, The Maestro feels solid in your hands. With some mobile phones it feels like you're holding a popsicle stick in your hands - careful don't crush it! With others, it feels like you're holding a calculator in your hands - careful don't snap it! But the Maestro feels the way a cellphone should - solid and empowering in your hands because more than other device, the modern mobile phone has become the central life device of nearly everyone on the planet! Don't delay, click "Add to Cart" right away and in a few days you could be the proud owner of this state of the art unlocked dual SIM dual band touch screen mobile wonder with incredible DVB-T reception! Brought to you by the leader in factory direct China electronics - Chinavasion. This phone records phone conversations too! Fantastic product. digital TV & Radio works well in most areas, even where the signal strength is not that good. Mobile Phone and other features very good. Worth the money. I was surpriced when my order arrived. Nice packet and inside this grat phone. I like it. Thank you very much Chinavasion!